The Tenement: The Crusie Lamp. I searched high and low, through site after site but couldn't track down a little crusie lamp. Eventually, I went to Olde Charm Miniatures with some pictures and I was thrilled when they said they could make me some. 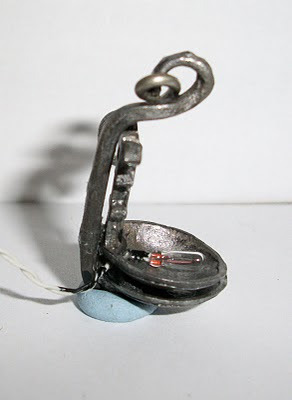 These little lamps were used by the poorer ranks of society and burned fish oil (you can imagine the smell!). They were used round coastal areas of Britain and on the Continent but seemingly the Scottish ones had a second dish. This was used like a drip tray and collected any surplus oil. The little grooves on the upstand of the lamp meant that the top tray could be tilted so the oil was nearer the wick which was made of hemp or rush - depending on the area you lived and what was availalble. They were usually hung on the wall where the light was needed by means of a hook. There are two in the Cloth Merchant's Booth and I've already got them wired in. Once certain things are dry and in place, I'll take more pictures of today's progress. I didn't know about that kind of lamps. It is very interesting. Your miniature one is great. Thanks Genevieve, I couldn't find any miniature ones so had to get them specially made. I'm really pleased with the way they turned out. Hello Norman - thanks, I'm pleased you're finding it interesting. I try very hard not to sound like a history lesson - lol. OC Miniatures is a good site and they're very helpful. They're making another light fitting for me as we speak!